Advanced additive manufacturing techniques such as electron beam melting (EBM), can produce highly porous structures that resemble the mechanical properties and structure of native bone. However, for orthopaedic applications, such as joint prostheses or bone substitution, the surface must also be bio-functionalized to promote bone growth. 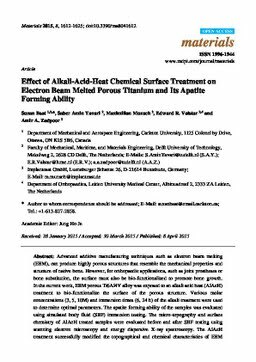 In the current work, EBM porous Ti6Al4V alloy was exposed to an alkali acid heat (AlAcH) treatment to bio-functionalize the surface of the porous structure. Various molar concentrations (3, 5, 10M) and immersion times (6, 24 h) of the alkali treatment were used to determine optimal parameters. The apatite forming ability of the samples was evaluated using simulated body fluid (SBF) immersion testing. The micro-topography and surface chemistry of AlAcH treated samples were evaluated before and after SBF testing using scanning electron microscopy and energy dispersive X-ray spectroscopy. The AlAcH treatment successfully modified the topographical and chemical characteristics of EBM porous titanium surface creating nano-topographical features ranging from 200-300 nm in size with a titania layer ideal for apatite formation. After 1 and 3 week immersion in SBF, there was no Ca or P present on the surface of as manufactured porous titanium while both elements were present on all AlAcH treated samples except those exposed to 3M, 6 h alkali treatment. An increase in molar concentration and/or immersion time of alkali treatment resulted in an increase in the number of nano-topographical features per unit area as well as the amount of titania on the surface.